A school of thought holds that letting your baby "cry it out" teaches him to fall asleep without comfort. 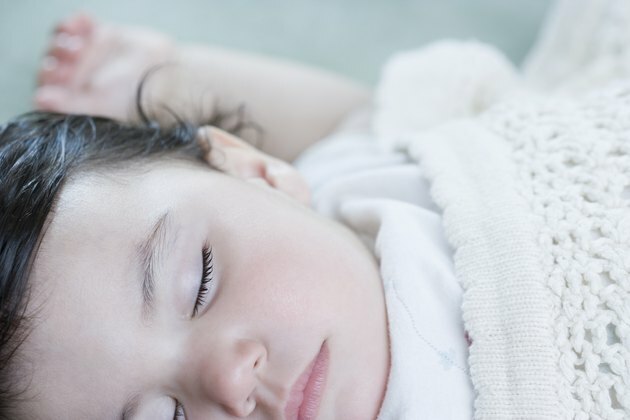 Some sleep and parenting experts swear by the value of letting your baby soothe himself, while others believe you should swoop in to provide comfort at the first tear. Rely on your own instincts, and advice from your pediatrician, to decide the right sleep method for you. A newborn should not be left to cry on his own. Even if you want to try the "cry it out" method, don't start until he's between 4 and 6 months old and ask your pediatrician if your baby is ready. You shouldn't let him sob for an hour; when you're first introducing self-soothing, don't let him go more than a few minutes before checking on him. Above all, follow your own instincts. If you feel like his cries aren't dying down and he's in distress, go check on him. A 10-minute fit isn't going to damage him permanently, but repeatedly leaving him to cry himself to sleep without any comfort can be risky. Letting him cry for too long will not only be upsetting for you but can be damaging for him. This can impair his abilities to relate to others, according to University of Minnesota professor Darcia Narvaez, and soothing your baby can actually help him become more independent in the long run. Furthermore, ignoring his cries could mean missing a real problem such as a fever or vomiting. In 1985, pediatrician Richard Ferber published the book "Solve Your Child's Sleep Problems." In the book, he advocated a cry-it-out sleep ritual that many parents still use today. If you want to try his method, put your baby down to sleep and leave the room. Wait outside to see if he cries; if so, go back into the room after three minutes and rub his back while saying soothing words. Leave, even if he's still crying, and return after five minutes of crying to soothe him again. Don't pick him up. Continue this pattern of soothing and leaving, increasing your wait time by a few minutes each visit, until he falls asleep. It's normal for a baby to fuss and cry a bit before bedtime, but if he breaks into sobs every time you lay him down, make some changes in your rituals. If he's consistently nodding off at 7 p.m. or seems wide awake until 10 p.m., adjust his bedtime accordingly so he's not overtired or too alert to sleep. Once you've established a bedtime, make the 30 minutes beforehand quiet time. Dim the lights wherever he is to help him settle down. He should be drowsy as you're putting him to bed. Give him a pacifier and rub his back for a few minutes to help him drop into sleep. Parenting; Ask Dr. Sears: Letting Baby Cry; William Sears, M.D. Psychology Today; Dangers of “Crying It Out”; Darcia Narvaez, Ph.D.